Laboratory testing is an integral component of the detection, diagnosis and treatment of cancer and hematologic disorders. To provide our patients with the most comprehensive care in a convenient setting, we offer fully accredited laboratory services at many of our practice locations. Arizona Oncology laboratories consistently achieve the highest attainable standards of laboratory excellence, and employ only highly qualified technical personnel and instrumentation. Our team of experienced certified laboratory professionals will work closely with your physician and nurses, providing them with rapid and reliable results for those tests which will be used during your care. Having direct access to your test results in an efficient manner, enables your physician to prescribe or adjust your treatment plan as needed without unnecessary delays, in addition to the convenience provided to you by having your laboratory testing performed during your visit. 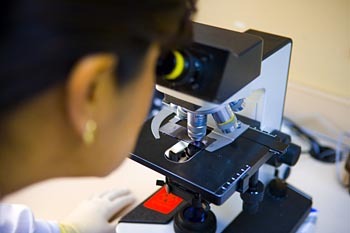 If your physician requests laboratory testing not performed by our Arizona Oncology laboratories, those tests may be sent to outside laboratories for processing. We will work within your insurance company’s guidelines, as your plan may require lab tests be performed at one of their contracted laboratory facilities. Although the time period required for processing and receiving test results may vary, your physician will review your results as soon as they become available, and discuss them with you at your next visit. If any of your test results indicate a condition requiring immediate attention, your physician or nurse will contact you without delay.